Once we have received the 250€ deposit your space for the corresponding fitness holiday dates is reserved. The Fitness Holiday Company Marbella will send you a confirmation by email within 24h. The final payment is due latest 15 days before arrival. The fitness Company Marbella is under no obligation to send reminders. In case the final payment is still not made 5 days before arrival we reserve the right to sell your space. In this situation we will refund your deposit minus 80€ administration fee. We require a 250€ deposit upon reservation and the remaining balance should be paid latest 15 days before arrival. The payment can be made online by requesting an online payment link through a secure banking website, by card over the phone or by bank transfer. Within 24 hours of receipt of payment you will receive booking confirmation, which will include a health questionnaire and administration documents. In case of a cancellation from your side later than 15 days before arrival we offer a full refund minus a 80€ administration fee. Within 15 days of arrivals the Fitness Company Marbella is under no obligation to arrange a refund. The fitness Company Marbella will in no case take responsibility for food and drinks taken outside the presence of a staff member or/and agreed times to eat with the group. Alcoholic drinks and fizzy drinks are NOT included in the package. We are not responsible for any transfers outside the timetable. ONLY on the specific arrival and departure dates (Full week Sunday/Sunday and Half week Sunday/Thursday). Outside those time we can ask for a surcharge of 65€ per trajectory. We cannot always guarantee immediate pick up or last minute drop off times. 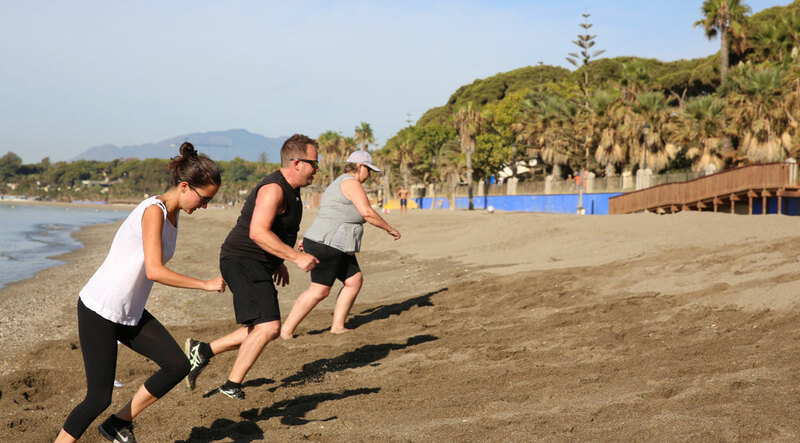 The Fitness Company Marbella its directors, collaborators, partners and employees are free from any liability of injury, loss or damage to personal property associated with activities participated in this event. We consider adequate and appropriate travel insurance to be essential. Please read your policy details carefully and take them with you on the trip. It is your responsibility to ensure that the insurance cover you purchase is suitable and adequate for your particular needs and holiday you are participating in. Please check if access to a private hospital is included, as they are more accessible in Spain. Except expressly stated in these conditions, we cannot accept liability or pay any compensation where the performance or prompt performance of our obligations under our contract with you is prevented or affected by or you otherwise suffer any damage, loss or expense of any nature as a result of "force majeure". In these booking conditions, "force majeure" means any event which we or the supplier of the service(s) in question could not, even with all due care, foresee or avoid. Such events may include actual or threatened war, riot, civil strife, terrorist activity, industrial dispute, natural or nuclear disaster, adverse weather conditions, fire and all similar events outside our control.